Apart from going for a wildlife adventure in Sandakan for Borneo Holidays, exploring the delicious delicacies in Sandakan City is also an adventure for me! One of the places that I would not miss to go whenever I visit Sandakan, would be 7-Heaven Dessert Parlor. Moreover, it holds a place in my heart as one of the best places to go when in Sandakan city. They specialize on a variety of desserts ranging from Western to Korean desserts, but they are famous for their yummilicious yogurt ice cream! 7-heaven Dessert Parlor is located in Bandar Indah, Mile 4, and it is the same row of shop lots with Islamic Bank, Malay restaurants, boutique shops, etc. Some might think that 7-Heaven Dessert Parlor is just an ordinary place to eat dessert, but I can assure everyone that this place will never fail to surprise anyone with their unique taste of desserts. The price is affordable and it is cheaper than Secret Recipe dessert (yes, this is true!). Apart from that, the settings inside the shop offer anyone a relax and cozy place to hang out while indulging the sweet desserts. If you have some extra free time in Sandakan, and looking for something sweet to wash down all those spicy food as well as seafood that you had for lunch or dinner, then 7-heaven is the perfect place to be after. Apart from that, going for a tour to Sandakan can be a bit difficult if you don’t have any idea to go. 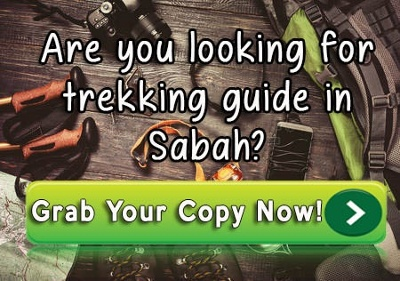 So, feel free to read our travel guide to Sandakan, where you can know more destinations that you should visit in Sandakan. You might have experienced riding a gondola in the Grand Canal, or cruising along the Mississippi River to explore the historical waterways of The United States of America. But nothing beats the experience and feeling when cruising down the rivers in Borneo. When coming to Borneo, there are numerous ways to enjoy the wildlife. One of the means where people enjoy learning and experiencing the wildlife in its natural habitat here in Sabah Borneo is via a relaxing cruise down the river. 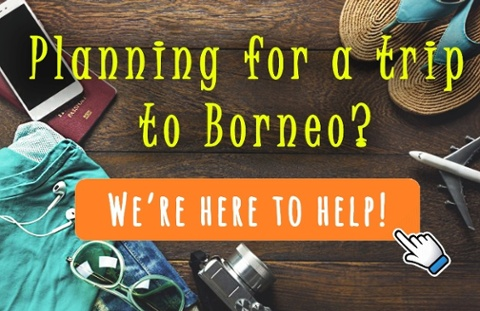 Borneo is the second largest island in the South Pacific (third largest in the world), which is split between the nations of Malaysia, Indonesia, and Brunei. It is known that Borneo has the oldest rainforest (roughly 140 years million old!). Additionally, it is an important ecosystem for many endemic species of Borneo Plants and Wildlife. There are some articles from National Geographic featuring some of the Borneo Wildlife, such as Borneo Pygmy Elephants, Orangutan, Proboscis Monkey, Clouded Leopard and more. Still have no idea where Borneo is? 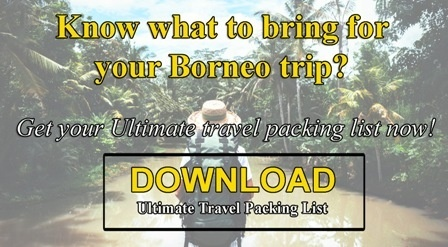 Click here to see Borneo Map! Borneo river cruise is generally one of the top activities for Borneo holiday seekers, especially in Sabah Borneo. Embarking on a Borneo river cruise is a lifetime experience for you to discover the pristine Borneo rainforest and a chance to spot some Borneo Wildlife. We would not be surprised after your Borneo river cruise, you will be captivated by the charm of this special place and will not miss to go for another round of Borneo river cruise. Going for a Borneo river cruise at the Kinabatangan River, which is located in Sandakan, Sabah Borneo, will give you a chance to spot the critically endangered Orangutan species. Although you can easily spot Orangutans at the Sepilok Orangutan Rehabilitation Centre, we recommend you to make the effort to see the Orangutans in their natural habitat. Long – nosed Proboscis Monkeys! Proboscis Monkeys can be spotted while you are cruising along the mangrove swamp area in Sabah Borneo. Since Proboscis Monkeys prefer to live almost exclusively in mangrove forest (they can also be found in lowland forest that are near to fresh water and rivers), it is impossible for you to not spot the primates in your Borneo river cruise tour, such as in Weston River, Kinabatangan River, and many more. Experience an up-close and personal experience of witnessing Proboscis Monkeys, as they jump from one tree to another (some jump from one side of the bank to the other!). Apart from spotting Orangutans and Proboscis Monkeys, spotting Borneo Pygmy Elephants is also another reason as to why going for a river cruise here in Sabah Borneo is different. If you are lucky, you might even sight a group of Borneo Pygmy Elephants strolling by the river bank. Borneo Pygmy Elephant is relatively small compared to other elephant species, but still grows up to 3-metres tall and weigh a few tonnes. Get your binoculars ready in search for Borneo Pygmy Elephants! If you are a bird lover, joining a Borneo River Cruise will be a perfect activity for your Borneo holiday! Cruising along the Kinabatangan river is like a paradise for bird lovers. All eight of Borneo hornbill species can be seen regularly, Storm’s Stork, Blue-eared Kingfishers, various species of Eagles, and more endemic birds of Borneo have been spotted parading their beauty around the waters of Kinabatangan River. Even if you are not into birding, you can easily witness birds of Borneo gorgeously flying everywhere as you cruise along the river. Truly is a sight to experience. Sabah Borneo is known for its spectacular sunsets. It would be a double bonus for you if you get the chance to witness the “Reddish Fire Sunset” during your Borneo river cruise tour. Are you aware that Sabah Borneo is one of the places to witness Fireflies? Joining the night cruise will give you a chance to catch magical “performances” by the Fireflies slowly lighting up and decorating the mangrove trees (if weather permits). Many have experienced witnessing Fireflies lighting the sky at night which is similar to a Christmas tree being lit up. Cruising down the rivers here in Sabah Borneo is definitely a great adventure to experience, no matter as a single traveler, traveling with your family, or loved ones. I myself have gone for several river cruises and it never seems to bore me. Instead, it keeps pulling me back for more! The enthralling beauty that Mother Nature has given to us all always seems to enlighten me in many ways, and I hope it does for you too! If you want to read more on the experience of Borneo River Cruise, feel free to read our experience of the river cruise in Weston River and Kinabatangan river.